Many businesses need to have a supply of custom shopping bags on hand to let customers transport their purchases. Customer may use bags to carry groceries, other purchased goods or takeout food items. No doubt about it: bags are a vital item for every shop, restaurant, bakery, butcher shop, and many other retailers. Since plastic bags have appeared in the marketplace more than 50 years ago, they have been a top choice among retailers. In truth, plastic shopping bags provide many benefits to retailers over alternatives, such as paper or cloth bags. Plastic bags typically cost only a fraction of a cent per bag, which is much lower than the cost of paper bags, which averages five cents per bag. Cloth bags can cost up to several dollars per bag. Plastic bags are also lightweight and easy to store. This means they take up less space than other bagging products in a retailer’s checkout center. Moreover, plastic bags are much easier to open and double up. This saves valuable time at checkout and can help promote faster transactions and better customer service. In addition, plastic bags have several distinct environmental benefits over paper and cloth bag options. Consumers should learn these facts about plastic bags so that they can make the right choice at the checkout counter. Companies should gain understanding of the eco-friendly benefits of plastic shopping bags so that they can make wise investments and select the best custom shopping bags for their business. Do you know whether plastic bags or paper bags require more energy during production? Do you know whether paper or plastic bag production results in more air production? Read on for the answers and share your thoughts in the space below. According to the United States Environmental Protection Agency (EPA), Americans use approximately 100 million plastic bags per year. Yet, the American Forest and Paper Association reports that Americans use only 10 million paper bags per year. The easy-to-use and convenient carry benefits of plastic bags are the motivating factor behind this wide variance. However, a fact these statistics don’t show is how widely Americans reuse plastic bags. Many people tuck plastic bags away after shopping and use them for lunches, garbage bin liners, home storage, and many more applications. Plastic bags last much longer than their paper counter parts. People can rinse them out and use them over and over again, possibly for years. In addition, plastic bags are extremely easy to recycle. Many major retailers, such as grocery stores, have convenient drop off locations for plastic bag recycling. This means people do not need to make any special trips to recycle plastic bags. Instead, they can carry them with them when they go shopping and make recycling part of their everyday routine. 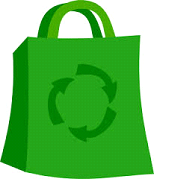 Diligent recycling by customers can negate any perceived environmental drawbacks to using plastic shopping bags. According to the EPA, Amercians can do much better with their plastic bag recycling efforts. During 2012, Americans recycled just 12 percent of plastic bags, sacks, and wraps used in the U.S. during that calendar year. Any trash that we do not recycle goes to local landfills. That includes both paper and plastic shopping bags. It is easy to see that plastic bags are far more compact than paper bags. In fact, plastic bags take up just 0.4% of landfill space, an extremely small amount. By contrast, paper bags take up 1.0% of landfill space, which is more than double the amount of landfill space used by plastic bags. In addition, paper bags weigh six to seven times more than plastic bags. Most municipalities pay fees to use local landfills based on the weight of the trash they deposit. Higher weight translates to higher fees. That means routine use of paper bags instead of plastic ones can create higher costs for cities, towns, and counties. Often, municipalities pass these costs onto customers through taxes and other forms of revenue collection. The bottom line: companies who choose plastic custom shopping bags are making a smart cost-saving move for both themselves and their customers. Many consumers and business owners do not think about the environmental production costs of paper and plastic bags. It is important to know the environmental impacts of paper and plastic bag production when choosing which bag to use. The EPA has verified that paper bag production takes 40 percent more energy than plastic bag production. In addition, paper bag production creates more pollution. Research shows that paper bag manufacturing creates 50 percent more water pollution and 70 percent more air pollution than plastic bag manufacturing. Companies should keep these facts in mind when choosing custom shopping bags for their business. As these facts prove, plastic shopping bags offer more than just convenience benefits to companies—they offer environmental benefits too. Companies can choose standard plastic bags custom-printed with their company logo, message, and contact details. Alternatively, companies can select biodegradable custom shopping bags for an even bigger environmental statement. When selecting shopping bags, you want to work with a leading expert with decades of providing custom bags for businesses. You can follow in the footsteps of many savvy companies who have chosen A.N.S. Plastics as their packaging partner. We can work with you to design a standout custom plastic shopping bag for your company and help you select the quantities that are right for your needs. In addition, we supply bulk quantities of bags to help you save even more on your packaging costs. What benefits do plastic shopping bags offer your business? How do you educate your customers on the eco-friendly benefits of plastic shopping bags so that they can feel good about their choices—and yours? Add comments below to share your insights. We look forward to hearing from you.